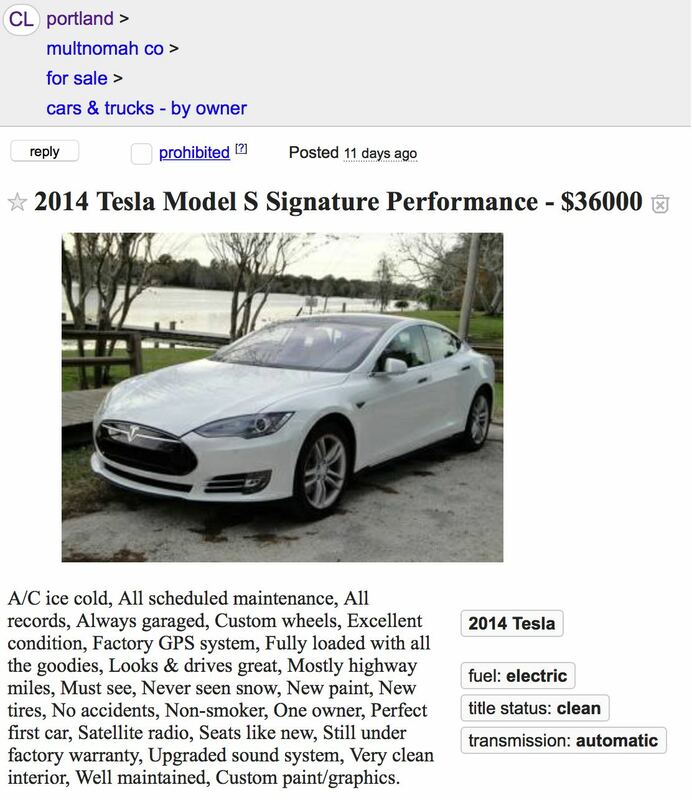 Of course, on second glance, I realized it had to be a scam—the value of a 2014 Tesla Performance (85KWh battery with the Performance option) should be at least double the $36K asking price in that advert. A/C ice cold, All scheduled maintenance, All records, Always garaged, Custom wheels, Excellent condition, Factory GPS system, Fully loaded with all the goodies, Looks & drives great, Mostly highway miles, Must see, Never seen snow, New paint, New tires, No accidents, Non-smoker, One owner, Perfect first car, Satellite radio, Seats like new, Still under factory warranty, Upgraded sound system, Very clean interior, Well maintained, Custom paint/graphics. I’ve bought a lot of stuff off Craigslist, but never a car. I wouldn’t hesitate to do so, though, as long as I could meet the seller in person to see and drive the car.